Increasing global temperatures have created both serious challenges and unique opportunities for archaeology in the circumpolar north. Permafrost and glaciers are melting, putting archaeological sites at risk, but also exposing previously unknown heritage resources. For the past 20 years archaeologists and First Nation researchers in Canada’s Yukon have been investigating rapidly melting alpine ice patches traditionally used for hunting caribou. Hundreds of ancient, organic hunting tools have been recovered from these patches that provide an extraordinary record of the technological traditions of Indigenous hunters spanning more than 9,000 years of Yukon’s sub-arctic history. This presentation will provide an overview of the Yukon Ice Patch Project and explore the collaborative working relationship with indigenous communities and implications for heritage management. The talk will also review the challenges posed by environmental change, the newly developing field of glacial archaeology and possible implications for international research agendas. 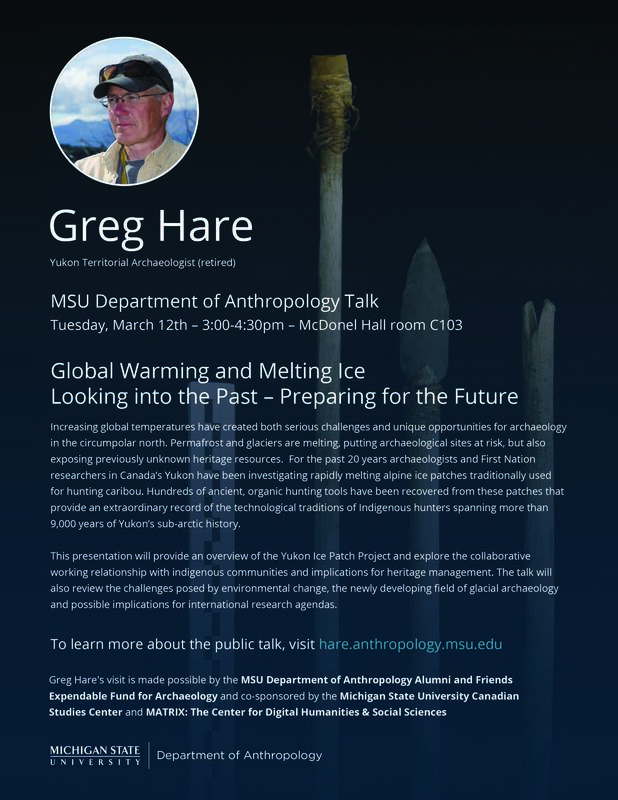 Greg Hare is the former Yukon Archaeologist and Senior Projects Archaeologist with the Government of Yukon, Canada. He recently retired after 30 years of service. During that time, he was involved in a variety of archaeology projects but his research for the past 20 years was been primarily focused on the Yukon Ice Patch Project, a multidisciplinary research initiative taking place in the mountains of southern Yukon. The project is a collaboration between the Yukon government and six Yukon First Nations, combining community based research interests with ground-breaking archaeological discoveries. Ice patch research in Yukon is part a newly emerging field of study known as glacial archaeology, practiced in numerous circumpolar and other countries. The Yukon ice patches have recently been added to Canada’s tentative list for UNESCO World Heritage sites. Greg is an editor of the Journal of Glacial Archaeology, Sheffield, U.K. and in 2012 he was program chair for Frozen Pasts – the 3rd International Glacial Archaeology Conference, in Whitehorse Yukon. He studied anthropology and archaeology at the University of Victoria and University of Alberta, Canada and lives in Whitehorse, Yukon, Canada.